A live Lasik Eye Procedure. 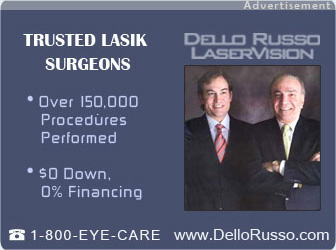 Lasik testimonials featuring many patients. Interview with a lasik surgeon. Losing sight due to illegal procedures. Fox News talks about the risks about how lasik might damage your eye. A live lasik procedure shown using tracking software. Dr. Neil Sher explains about PRK and LASIK Treatment. A Spanish Advertisement for Lasik Surgery. An advertisment for Cataract Surgery. A news report about the benefits of Cataract surgery.